Small Walk-in Closet Inspiration Right Now! 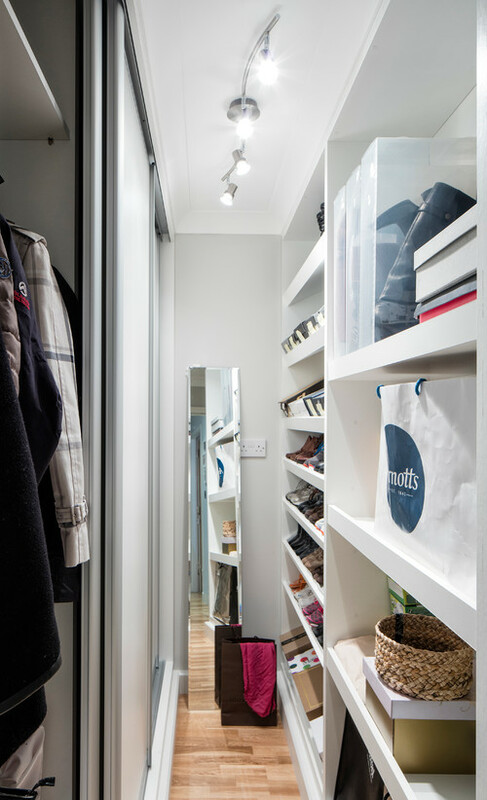 If you are struggling to create functional space in your small walk-in closet enjoy these simple inspirational images to get your organizing ideas flowing in your small walk-in master closet. Free Printable to plan your new closet space! This year we have lots of projects planned for our home. 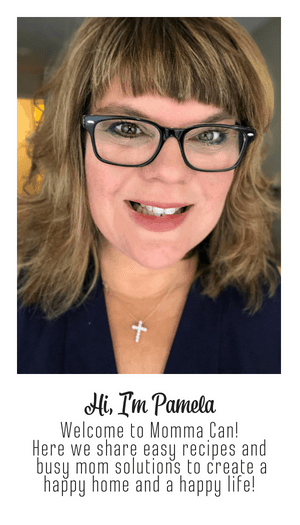 Budgeting is a real thing so many of the projects that are big-ticket items are taking precedence over other things that are dear to my heart. One of those is our small walk-in closet. Today I am sharing some of my favorite small walk-in closets finds to get you inspired to take on a budget-friendly master closet update! Are you ready for some Master Bedroom Small Walk-In Closet Inspiration? The picture above was the first photo I saw when I searched in Houzz for closet inspiration. I would not consider this small! White just brightens a closet! The brighter the interior the better! The light blue walls are nice, but on a budget just keep the white paint already up! I mean why not? You can add color using your clothes and accessories! Color! Okay, Now I am going to change my mind! If I had a larger walk-in I would totally wallpaper with some bright tropical wow! And just look at the cute little cubby full of inspirational knick-knacks. I am thinking that getting dressed each morning with things you love is on my list of to-dos for our master closet update! 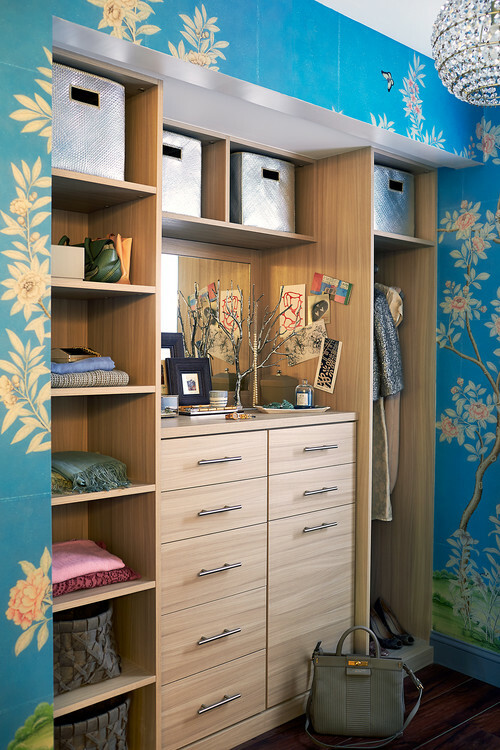 Helpful tips for creating a closet you love! Research Pinterest, Houzz, and your favorite Organizing Stores. Take great notes and create a Pinterest Board with all your favorite ideas as well as an Idea Book on Houzz. Grab our FREE PRINTABLE Closet Planner and write your wish list and find tips on how to organize your closet and use the grid to sketch your design. This printable is Free in my AMAZING Resource Library. Get your password at the end of this post. A master bedroom closet needs excellent shoe storage. I find that if I hide my shoes, I forget they existed. Open storage is a win for me. What this closet is missing is LIGHT! Color me green with envy! This closet is a dream closet! Great lighting, lots of storage, a great mirror, and a little cute seat to put on your cute shoes! This is a dreamboat master closet! Giggling like a school girl, here is the last closet’s skinny cousin! But still look at the shoe storage! And the bright light really helps with the slim, slim walkway! You really need to be tidy to keep a space this small functional. My messy teen would not survive this closet! I am pretty sure his school books would be buried alive! However, this space is perfect for someone who loves order. 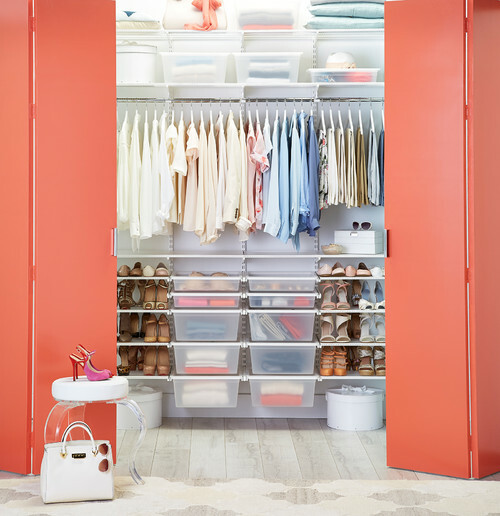 Hmm, this is a beautiful closet that has obviously been designed to please the user’s eye with its light palette clothing choices with hints of Living Coral or at least it looks like Panetone 2019 color of the year! Crush! I love the color and the small walk-in style closet is amazing! 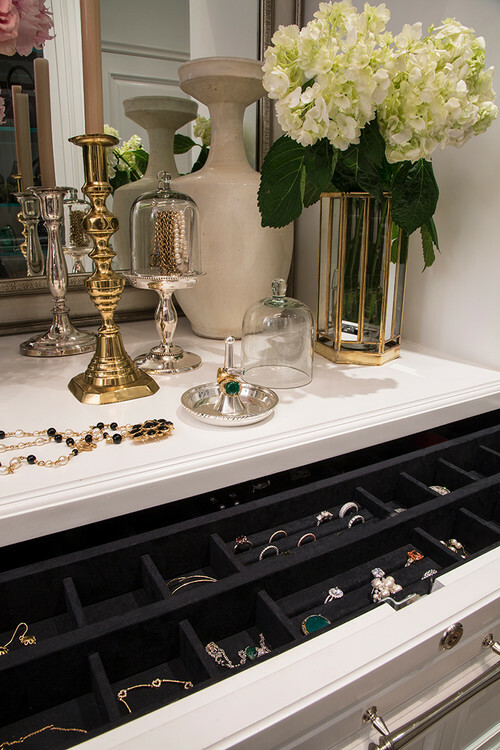 Jewelry and watch storage is pretty important in new closet designs. I do not have lots and lots of jewelry but the few pieces I do have are very sentimental and loved. I also have religious items that are similar to jewelry that I like to see and use daily. 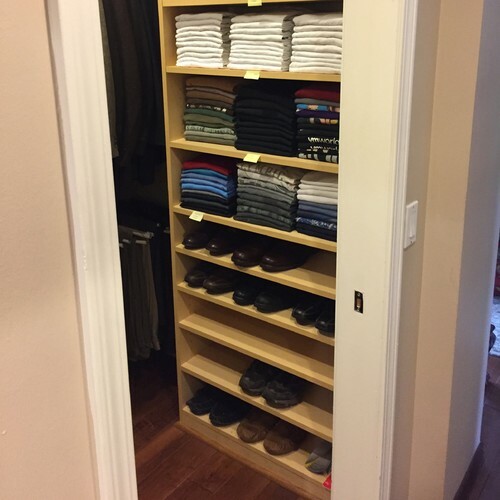 We would never need a series of drawers as pictured but I would like to find a solution for our small walk-in closet. In a nutshell, I have three takeaways from my searches for small walk-in closet inspiration. 1. Keep the colors light and bright with white shelving and storage. 3. Add elements that showcase things I love. 4. Make it a place I want to visit each morning to find an outfit quickly and enjoy the process of choosing what to wear as well as tidying up. My first closet update on the blog. I organized my closet in three steps! And yep this still works! This blog post helps me realize my photography has improved over time! Made me happy! Eek! 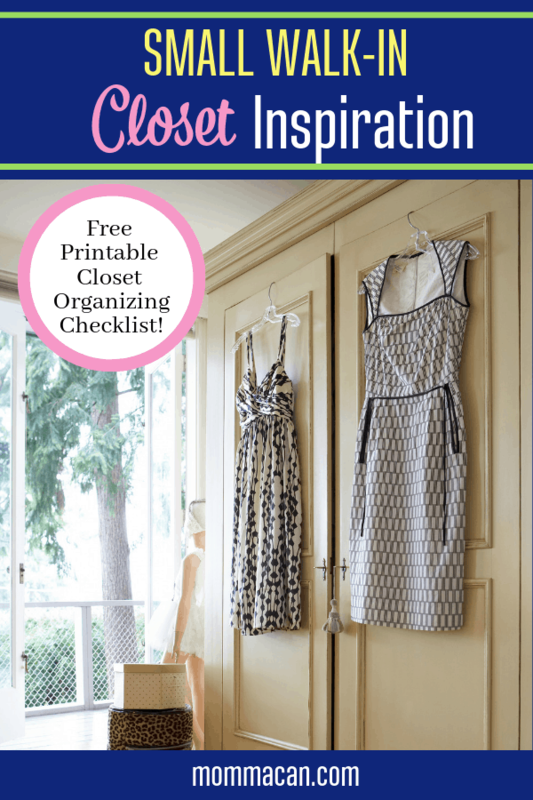 Don’t forget to signup for the free printable PDF Closet Organizing Checklist! Get your password below. I love your I inspiration for your closet! I am a lover of pretty bright wallpaper, I wish ours was large enough to add some, but I am going with ten leave it white…I think, lol! I can’t wait to see how it turns out! !